When Rona Blackburn landed on Anathema Island more than a century ago, her otherworldly skills might have benefited friendlier neighbors. Instead, guilt and fear led the island’s original eight settlers to burn “the witch” out of her home. So Rona invoked the privileges of a witch; she cursed them. But such a spell always comes with a terrible price, and in punishing the island’s residents, Rona also bound her family ever tighter to them. Fast-forward to the present day and all Nor Blackburn wants is to live an unremarkable teenage life. And she has reason to hope that she may have escaped the thorny side-effects of the family matriach’s curse. But then a mysterious book comes out, promising to cast any spell for the right price. The author – Nor’s own mother – seems capable of performing magic that should be far beyond her capabilities. And such magic always requires a sacrifice. A storm is coming. It’s coming for Nor. 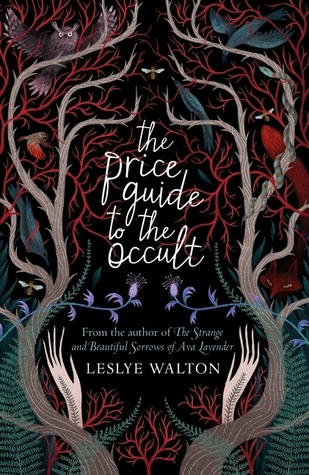 The Price Guide to the Occult is one of those dazzling books that you read in a dizzying rush of exhilaration, and then can’t quite figure out how there are no more pages left. From the moment I finished reading the Prologue, I was utterly enraptured. It took some serious self-control on my part to wrench myself away from the story and re-enter the real world. Leslye Walton writes in such a way that you find yourself underestimating just how deeply she has you ensnared – and then by the time you realise just how tightly you’re wrapped around her little finger, it is far, far too late. It’s the best kind of practical magic: falling completely and utterly into a story so that its intricate workings and mechanisms are as invisible to you as they are to the characters themselves. In the interests of preserving the enchantment of Price Guide, I’ll keep this review as short as possible. One of the many joys of this novel is the way the plot and its characters unfurl under even the slightest curious touch. By no accounts is it perfect, but its distinctive style and unconventional characters make for a quietly unique and undeniably enjoyable reading experience. Enter into it without expectations, and you won’t be disappointed. Recommended to: Anyone who enjoys easy, witchy reads.